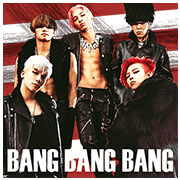 http://www.line-stickers.com/ – BIGBANG Line Sticker | The wait is over, the boys of BIGBANG now have their own sticker set! Don’t worry, you won’t have to choose just one member for your chats. G-DRAGON, T.O.P, TAEYANG, DAESUNG, and SEUNGRI are all here and ready to bring their style to your chats!